The Stressless Breeze LegComfort seater sofa includes a ew electric integrated footrest, which works at the touch of a button. A light press of a button elevates the concealed footrest to give the legs and feet the comfortable support they need. Sleek and lustrous lines combined with soft contours are the basis for the Stressless Breeze design. 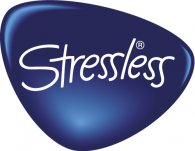 Stressless aims to give its sofas the same unparalleled sitting comfort found in its range of recliners. Breeze has individual seats that recline independently and the sofa also introduces a footrest, which is hidden under each seat, until the moment you need it.The Stressless Breeze also carries a seat pocket for your favorite reads. Design-wise, the Stressless Bliss recliner is a perfect match. Stressless® recliners and sofas now offer even more comfort thanks to the LegComfort™ system. The space-saving integrated footrest can be perfectly adapted to suit individual body types and offers a uniquely comfortable sitting experience. An optional battery pack is also available so that you enjoy the LegComfort™ system wirelessly. The LegComfort™ system can be easily operated by gently pressing touch sensitive buttons and is faster than comparable systems. The length of the footrest can be individually adapted to your own leg length. The elegant and slim design makes it easy to get out of the seat and offers complete freedom of movement even when the footrest is elevated. The LegComfort™ system is also combined with the popular Stressless® Glide and Plus™ systems. This means, the lower back and neck area receive the optimal support they need. The front end of the footrest automatically adapts to the position of the feet so that the ankles and heels receive optimal relief. All Stressless® models with the LegComfort™ system come with a 10-year warranty on the steel frame, and internal mechanisms. In addition, you get a 5-year warranty on all electrical parts. The footrest is hidden under the seat and then revealed through light pressure to the elegantly integrated buttons on the side of the seat. The front of the footrest is angled for maximum relaxation; allowing the natural angle of the ankles in all positions. At Potburys of Sidmouth, we can deliver your new Stressless sofa or recliner safely to your door for FREE (UK mainland). Please telephone for details including prices: 01395 515555. To place an order or for further information, please telephone: 01395 515555.